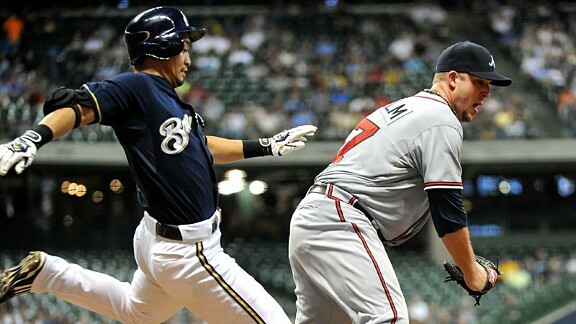 Atlanta's six-time All-Star catcher Brian McCann will come off the disabled list on Monday when the Braves open a series in Cincinnati. Atlanta Braves right-hander reliever Cristhian Martinez was put on the 15-day disabled list Friday because of a strained right shoulder, making room on the roster for recently acquired right-hander Luis Ayala. The Atlanta Braves avoided arbitration with five players Friday, including outfielder Jason Heyward, starting pitcher Kris Medlen and reliever Eric O'Flaherty. Washington reliever Drew Storen, who failed to hold a ninth-inning lead against St. Louis in Game 5 of the NL division series, is among six extra players eligible for salary arbitration this winter under baseball's new labor contract. The Atlanta Braves' roster for their wild-card game against St. Louis includes nine pitchers, including three starters. The second wild card is a goofy, ridiculous idea that goes against everything baseball history stands for: That the regular season is the ultimate test of a team's ability, strength and toughness.